The friends of Central Park is the community group that works along side Wirral Council to help manage Central Park in order to help preserve and develop the Park as a public open space; to organise events within the Park and to provide a meeting ground for all persons interested in the Park. The friends of Central Park are part of the WCPP (Wallasey Central Park Partnership) a Constituted organisation which meets on a bi-monthly basis, where representatives of the park groups meet with representatives from the public and statutory bodies (Councillors, Wirral Council, Park staff, Police and NHS). who also have an interest in the Park. The Friends of Central Park is the proactive group of the park. They secure funding for the park, organise events and run the cafe, walled garden and toilets for the park. This groups also looks after the archives and plans projects and many of the events for the park. 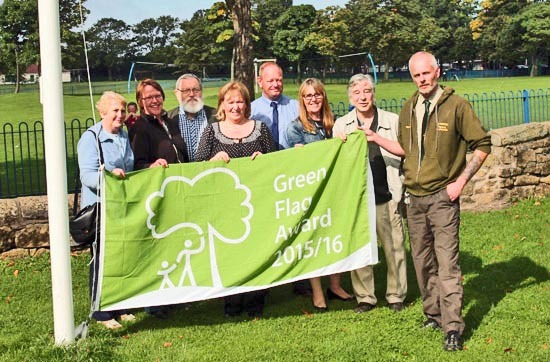 The Green Flag Award® scheme is the benchmark national standard for parks and green spaces in the UK. It was first launched in 1996 to recognise and reward the best green spaces in the country. The first awards were given in 1997 and, many years later, it continues to provide the benchmark against which our parks and green spaces are measured. It is also seen as a way of encouraging others to achieve high environmental standards, setting a benchmark of excellence in recreational green areas. At Central Park we have a number of ways you can get involved with the park. From working in Central Park Cafe, to gardening and to our back office areas like the archives. We have a volunteering opportunity for you. Please fill in the form and let us know a little about yourself and we will get back to you. Gardener's for Walled Garden & Rose Gardens. No experience necessary, light gardening & maintenance work in and around the gardens. Central Park operates as a community group and whilst we manage a tight ship and try to keep expenditure to a minimum, we also need to constantly re-invest in equipment and resources to continue important work with volunteers, communities and local projects. We are a great community group to donate to, we have a low cost to income ratio, which means your support goes further and also has a localised impact, meaning the people in our communities are the first to benefit.